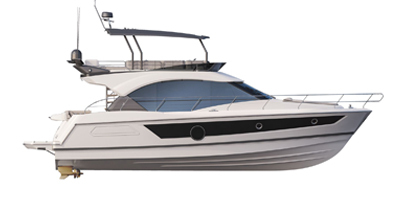 The Gran Turismo 49 Fly is a sport cruiser with a flybridge. Her bold silhouette is equivocally matched to her comfortable interior. Spacious and skillfully designed, she welcomes all friends and family aboard. The Gran Turismo 49 Flybridge features a sea view terrace, sunbathing area and enclosed wheelhouse allowing you to take full advantage of the exterior. In the cockpit, the bench seats convert into sun loungers creating another optional relaxing space to soak up the sun. To utilize interior space, a mezzanine has been designed and the L-shaped salon opens up to the indoor galley. The owner and guest cabins each feature a king size bed and heads with separate shower compartments to provide exceptional comfort for everyone on board. The salon includes large portholes to provide plenty of natural light and scenic views. The Gran Turismo 49 Fly cultivates a passion for sport cruising while offering a comfortable lifestyle second to none. The sport flybridge provides not only an additional living space but gorgeous panoramic terrace. The 360° view offers optimal safety and comfort. Equipped with a table and sun lounger, the open space can easily accommodate eight people. Ingeniously connecting the living space onboard with leisure activities in the water, the swim platform lowers just below the water’s surface. Designed to withstand loads of up to 770 lbs, a dinghy or jet-ski can be stored here during navigation. A practical feature, the exterior locker can be used to store an inflated dinghy with its engine still in place. The Gran Turismo 49 Fly is constructed with a Volvo IPS 600 (2 x 435 HP) engine. IPS technology makes her responsive and easy to manipulate. Internationally noted for reduced fuel consumption and increased engine efficiency, Beneteau is the first brand to develop a hull specifically for IPS and is considered an expert in this field. The interior open galley enjoys ample light from the windshield and is fully fitted with electrical appliances. Extremely practical and plenty of storage space offers the same comfort you would have at home!